PANA (Protocol for Carrying Authentication for Network Access) is an IP-based protocol.OPenPana Projects aims for device to authenticate itself with network.It does not define any authentication protocol, key agreement key distribution, or key derivation protocols. Environments with link layer security. Environments with physical layer security. Environments where no lower security is available. The client part of the protocol is defined as PaC. It is placed in node and easily reach access network. 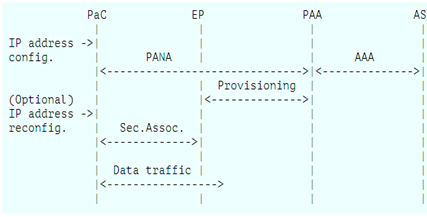 Server side of PANA protocol is PAA. It exchanges message with PaC for authentication and authorization. It is used to check the PaC’s credentials. It receives the PaC’s credentials by the PAA. Then it sends a packet with the result of credential checking process. It works in the basis of filter of a packet. It is a type of node which drops packet according to the parameters it sets.